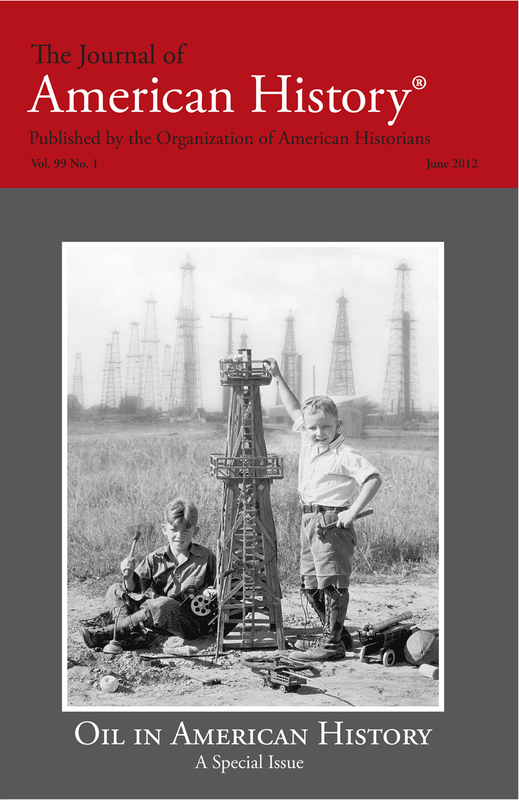 This special issue of the Journal of American History, “Oil in American History,” addresses one of the most central and controversial topics of contemporary political and social debates: the reliance of the United States and its citizens on petroleum and its by-products. For decades, American society has run on oil. Yet despite oil’s nearly pervasive role in our daily lives, few Americans have ever directly viewed the oil that travels from the well to their cars, and most consumers have had only a vague sense of their dependence on a multitude of synthetic materials derived from oil. Similarly, oil is largely invisible in many narratives of twentieth-century U.S. history. Prompted by a growing awareness of oil’s centrality to American life following a dramatic rise in crude prices, the spectacular drilling disaster in the Gulf of Mexico in 2010, and concern about climate change driven by the use of fossil fuels, this special issue of the Journal of American History assembles a variety of approaches to writing oil into U.S. history. The goal of the contributors to this special issue—Brian C. Black, Michael Botson, Paul Chastko, Craig E. Colten, Darren Dochuk, Sarah S. Elkind, Jay Hakes, Stephen Haycox, Diana Davids Hinton, Toby Craig Jones, Kairn A. Klieman, Robert Lifset, Karen R. Merrill, Kathryn Morse, David S. Painter, Joseph A. Pratt, Tyler Priest, Paul Sabin, Myrna Santiago, Christopher Sellers, Jason Theriot, and Christopher W. Wells—is not only to provide new analyses of traditional oil subjects, such as business, technology, and foreign policy, but also to explore novel themes, such as the social and cultural aspects of oil consumption, the environmental politics and impact of oil development, oil’s relationship to evangelical Christianity, oil and urbanization, labor organizing and government taxation of oil, and the depiction of oil in print, television, and film. Several essays contribute to the internationalization of U.S. history by examining American oil interests in Mexico, Canada, Nigeria, and the Middle East. Others highlight the distinctiveness of the Gulf of Mexico in the landscape of American oil. Together, the contributions to this special issue provide a unique lens on modern U.S. history.